If you do not know ways to convert PDF to Word, you need not worry. There are different techniques of PDF to word conversion. These different techniques and processes are known only to those who have studied and practiced them well. You may not have MS Word for doing PDF conversion to Word. With our data conversion service here to help you with PDF to text conversion, you neither need to install MS Word nor need to download any other application or tool. Our team will do your required PDF files to text conversion just as you want. How to convert a document to PDF? Well, it’s going to be much easier if you’re to do it after you’re done writing or editing documents that you’ve created in Word 2010. If you are not quite familiar with how you can do it, then you must look at the following steps so that you can do it successfully. If you’re writing an article or an essay, make sure that you complete editing or formatting the document before you actually save the document or convert it to PDF. Once you’re done editing or formatting the document, it’s now time for you to save the file. Ensure that you retain a copy of it in a Word format. You can do that by hitting the save button and then, create a file name for it. After you’ve saved the copy of your document in Word, it’s now time for you to convert it to PDF. Instead of hitting the save button, click File on the upper left-hand corner of the ribbon in Word 2010. Then, hit Save As. You’ll notice below that there is an option for Save as Type. Click on the drop-down menu and choose PDF. Rename the file to something else. Convert PDF to Word successfully done. Although Word gives you an option your documents into PDF, there are times that you may encounter issues with it, as the link you’ve included in the document won’t be retained, unless you type the entire URL for it. With that in mind, you can choose to go online and use a convert my document to PDF tools provided by online writing companies, which are really effective in performing such tasks. Now, ensure that you get to deal with the best of them online. Conversion from PDF to Word causes a whole new set of complications with your documents. There is no organization to what you see on the screen when you simply copy a document written in PDF, open a Word blank document and paste it there. The software we use to convert PDF file to word produces flawless results every time. The main reason for this is that we ensure that we make the best use of OCR preservation techniques to maintain the scanned contents that the document includes. This is one of the main essentials required to convert PDF to Word in an accurate manner. Get the help you need to convert a PDF to Word on time and accurately. This is what we guarantee. Place an order today to see how we work! When it comes to things that you can do to convert from PDF to Word online, hiring a professional to do it would actually make your life easier. Other than that, most companies that you see online offer tools that expertly developed to help you with converting PDF’s into other forms of document. Ensure that the company you’re dealing is legit and credible in providing tools or services that deals with PDF conversion. Make sure that you aren’t overcharged for tools or services regarding PDF conversion. See to it that you provide them all the information they need about the work order you’ve requested from them. Manual method with Adobe reader – You may use your mouse to copy and paste from Adobe Reader to Word. Another option is to go to the “Save As” option in Adobe Reader and click Save as Text. The .txt file that results can be copied into Word. The manual method is only practical for small files consisting mostly of text. PDF to Word conversion software – There are many different options both free and paid. The software can be installed in your computer and run from there. Open PDF files in Word 2013 – PDF files can be opened directly in Word 2013. However, there are a number of elements that won’t convert correctly including tables with cell spacing, page colors and borders, frames, tracked changes, footnotes and end-notes, PDF bookmarks, comments and others. Online PDF to Word converters – There are many online converters, with quite a few of them offering conversions free from PDF to Word. When it comes to things that one can have to for the best Word to PDF converter or vice versa, anyone can actually purchase software conversion tools that have developed to make one’s work life easier. These tools are widely available nowadays from professional writing companies. With these tools, any office professional won’t have to struggle just convert documents. If you’re wondering how you could benefit from these tools, wonder no more. These tools are developed with your work life in mind. Most developers of it took years to develop such tools so that they can provide the best one to help you convert documents very easy. Still Having Problems with Converting PDF to Word? There’s no need to let yourself become consumed with the stress related to converting PDF into Word because do this work in a very professional manner. You might think that all there is to it is simply a matter of copy and paste. However, when you take this step you will be horrified at the mess that results in converting Pdf files to Word. You will see where you can immediately benefit from professional help with the process we use. We convert more than text when you place an order with us for converting from PDF files to Word. We also convert a PDF to Word, which is a very important part of retaining the essence of the original document. Our professionalism is evident in all work we do for converting a PDF to Word for editing. Our services are widely used by publishers, librarians, author, students, entrepreneurs and teachers among many others. Converting PDF to Word can be a time consuming and tedious process but by getting our help, you can easily get results within minutes! We pay extra attention to details that make converting PDF to Word more efficient and top notch. When you avail our services, converting PDF files to Word will save you time and money and we can ensure you superior quality and accuracy. 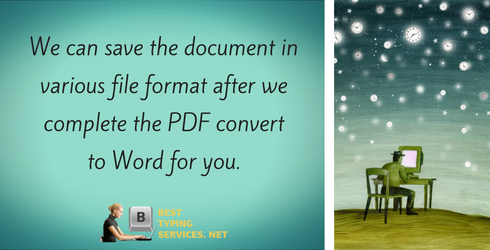 Get started now and seek help from our experts in converting from PDF to Word. 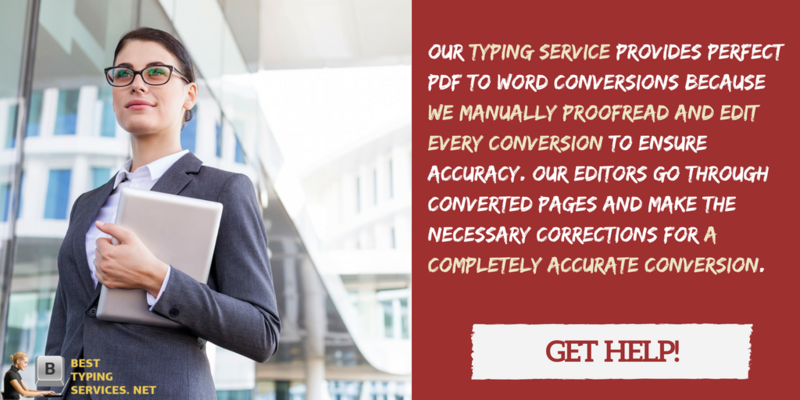 Our typing service provides perfect PDF to Word conversions because we manually proofread and edit every conversion to ensure accuracy. Our editors go through converted pages and make the necessary corrections for a completely accurate conversion. They can also convert handwriting to text. Our team members are professionals who are experts in their specific tasks. Experts do their task of data conversion properly as they have undergone proper training in their specific field of work. A professional trained in a specific field can provide the best service as their concentration and focus in on one task rather than many. A professional only becomes an expert after he/she has had a high qualification, proper training, skill, and experience. A trainee can never achieve the perfection in work like that of an expert. Trainees and amateurs are bound to commit errors in their work. This is a common learning process but experts do not commit errors. You get a polished and error-free PDF to text conversion. Experts do exactly what is asked for as they listen to you. Their primary goal is to offer you a quality service for what you asked for in an exact manner. Our experts are highly professional. With top-notch service, they also maintain the submission date. There is no compromise or delay with the submission. We make a commitment to all clients that come to us when they require converting a PDF to Word for editing purposes. Clients applaud the work we do for them in converting PDF to Word documents for them. This is why they keep coming back to place an order each time the need arises. They don’t need to purchase the software, which is expensive, or have an employee on staff to handle all tasks related to converting a PDF to Word. Submit the PDF file – Depending on the service used you may browse for the file to upload or you may drag and drop the PDF file. Select the conversion option – Again depending on the particular service used, different options are available. Some convert only to Word, while others offer additional options. Quite often you will be asked for your e-mail address. This is required as the converted file will be e-mailed. Select convert and wait for your conversion – Conversions are usually emailed although some services allow you to download files from the site. Several of the services provide good conversions when the PDF file is mostly text. Unfortunately, conversions that involved graphs and table didn’t have a good rate of success. Only services with OCR capabilities can convert scanned PDF files. We offer PDF to Word conversion services that are always successful and include scanned PDF files. When you need to change PDF file to Word, contact us for the most accurate conversions in the business!